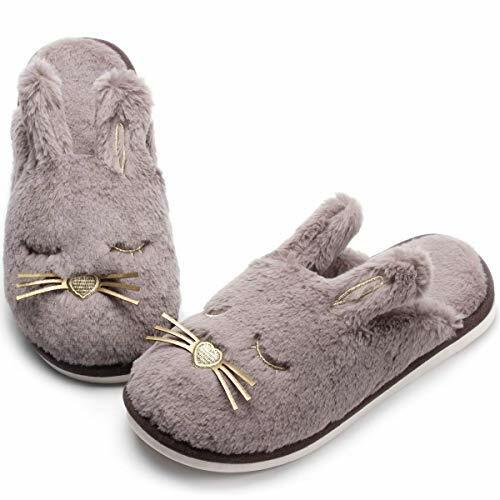 ✪ Size Suggestion - These cute stylish slippers are available in multiple colors and sizes. Small (5-6), medium (6.5-7), large (7-8.5). They could fit most standard foot size. ✪ Ultimate Comfort - Superior soft fleece fabric, featuring ultra skin-friendly, lightweight and comfy. Your feet will be surrounded by extremely cozy lining, like walking on a mushmallow. ✪ Feature&Design - Their lovely design will make your life more of fun. The insoles are anti slip and constructed with 3 layers of memory foam and sponge, will give you nice cushion support. ✪ Great Choice - Both hand and machine washable. It could be an awesome Valentine's Day, birthday, anniversary or Christmas gift. Slide your feet into our slippers and enjoy a new slipper wearing experience. ✪ Satisfaction Guarantee - We offer a 100% no risk money-back guarantee and 5 star customer service. Please inform us and we will do our best to give you the most satisfactory solution.